Four new patches have been released for ESX 3.5.0. It appears ESXi, ESX4, and other versions of ESX are not impacted. 3 of the 4 patches are rated critical. Adds support for Windows XP Embedded with Service Pack 2 guest operating system. Installing VMware Tools on Ubuntu 9.04 virtual machines display a message stating that no drivers are available for Xorg 7.5. This patch provides the VMware SVGA and mouse drivers for Xorg 7.5. May 20 17:14:44.398: vcpu-0| vmcore/decoder/decoder.c:655 0xd1e357 #UD e41d380f sz=4 ct=0. When SUSE Linux Enterprise 11 virtual machines installed with Virtual Machine Interface (VMI) kernel or virtual machines supporting VMI are booted into VMI mode, the virtual machines might stop responding or become extremely slow. On IBM systems having iBMC/IMM devices, during boot time, the CDCEther driver could not complete its device discovery due to a timing issue in the device firmware. This patch fixes the issue. The maximum username length of UserAccount in the VMware VI Toolkit is increased from 16 to 32 characters. Fixes an hostd memory leak issue with HTTP connection recycling when communicating with UI, SDK etc. 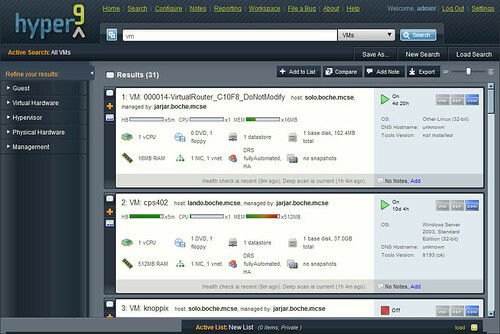 VMFS locks on ESX Server hosts might be incorrectly broken, when a previous unlock operation from the same host fails. Some virtual machines including Red Hat, Windows, and SUSE Linux Enterprise boot very slowly or might not boot at all when an EMC Symmetrix LUN in Not Ready state is attached to the virtual machines as an RDM device. After applying this fix, the virtual machines boot normally. I’m not sure what I like better – the informative video, or the fact that I can embed it neatly into my blog. Hyper9, a virtualization management startup company based out of Austin, TX, is expected to release version 1.4 of its self titled flagship management product on Wednesday. 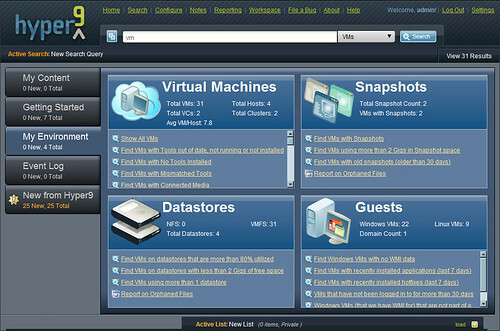 This is an exciting release as many notable improvements have been made to the user interface. New to this release is a dashboard which is designed to help the end user “hit the ground running” immediately after the product is installed. Upon login, the administrator will immediately presented with the “My Environment” tab of the dashboard. “My Environment” contains many of the most useful canned reports about the environment in which Hyper9 has been instructed to catalog. If you find “My Environment” is jumping in just a bit too fast, take a look at the “Getting Started” tab which contains several instructional videos that can be launched from within the Hyper9 console. Veteran Hyper9 users will find that the “Results” display has been cleaned up with no-nonsense resource indicators that are very much appealing to the eyes in my opinion. Hyper9 has been making great strides with their products and I’ve been very impressed with the amount of end user feedback they have taken to their developers and integrated into future product versions. Hyper9 is available today on a subscription basis. Head on over to their site for more information. While you’re there, be sure to check out their other products, such as the Virtualization Mobile Manager (VMM) which allows administrators to manage their infrastructures from a hand held device. I have it on good authority that the VMware Infrastructure 3 Advanced Technical Design Guide and Advanced Operations Guide book will be made fully available for download in .PDF format tomorrow. The authors over at vmguru.com had previously been releasing two chapters at a time (one chapter in each of the two sections of the book), but a decision has been made that the next release will include the entire book. Watch for the release at vmguru.com and grab your copy. If by chance they don’t make the Sunday release date, give them a break, these authors are among the hardest working in the business. I’m sure they’ll have it up very soon. This is a very generous contribution to the virtualization community as the book is only about a year old. Kudos to Scott Herold, Ron Oglesby, and Mike Laverick. Hopefully you are aware that to enable VMware vSphere’s FT (Fault Tolerance), you need FT compatible CPUs from Intel or AMD. VMware KB article 1008027 Processors and guest operating systems that support VMware Fault Tolerance outlines both the Intel and AMD CPU requirements to use FT. I had read this article months ago and on that basis I purchased FT compatible AMD Opteron 2356 Barcelona Quad Core processor upgrades for the HP DL385 G2 servers in my lab. Oddly enough, I was able to configure FT on powered off VMs. What I hadn’t noticed, or possibly what didn’t exist in earlier versions of this KB article was a chart at the bottom of the page with more verbose information that explained specific FT behavior based on the processor architecture. My AMD Barcelona processors do in fact support FT, however, the chart confirms that with my processors, the VMs must be powered off first before enabling FT, whereas Intel Xeon 45nm Core 2 processors I’ve worked with in other labs allow FT to be enable while a VM is running live. Also note in the chart below that there are FT support guidelines for specific Operating Systems as well. For instance, a Windows 2000 VM may never be FT enabled while running, and Windows 2000 is not an FT compatible guest OS on my AMD Barcelona processors. VMware Fault Tolerance (FT) requires specific processors and guest operating systems. VMware collaborated with AMD and Intel in providing an efficient VMware FT capability on modern x86 processors. The collaboration required changes in both the performance counter architecture and virtualization hardware assists of both Intel and AMD. These changes could only be included in recent processors from both vendors: 3rd-Generation AMD Opteron based on the AMD Barcelona, Budapest and Shanghai processor families; and Intel Xeon processors based on the Penryn and Nehalem microarchitectures and their successors. Download the VMware SiteSurvey (http://www.vmware.com/download/shared_utilities.html) utility to check if your configuration can run VMware FT. Yes – Virtual machine can be FT-enabled while powered on. No – Not supported by VMware FT. Note: System vendors are certifying that their systems work with FT. You can find details on the FT-certified systems at http://www.vmware.com/resources/compatibility. More systems are being certified all the time, so check back if your platform is not currently listed. You can also check processor, operating system, and virtual machine configuration compliance with FT by downloading and running the VMware SiteSurvey utility from http://www.vmware.com/download/shared_utilities.html. It highlights compliance issues and describes how to correct them. Receiving errors while trying to configure FT (Fault Tolerance) on a VM and stumped as to the reason why? This may help. Take a look at the vCenter server log in your vSphere Client and find the entry when the FT error occurred (the vCenter server log lists events in chronological order from oldest to newest, be sure to choose the correct log file as there are several to choose from). More specifically, look for the line reason = “blah blah blah”. In this case, the reason is “replayNotSupported”. recordReplayNotSupported The virtual machine does not support record/replay. Vm::Capability.RecordReplaySupported is false. replayNotSupported It is not possible to turn on Fault Tolerance on this powered-on VM. The support for record/replay should be enabled or Fault Tolerance turned on, when this VM is powered off.